A novel that feeds on the imagination, Voyage d’Hermès expresses the longstanding and unusual relationship between the house and travel. An interplay of paradoxes, complements and unexpected alliances upholds the premise of woody notes that are fresh yet musky, familiar yet surprising, hovering between impulsive and comforting, equally at ease with men as with women. 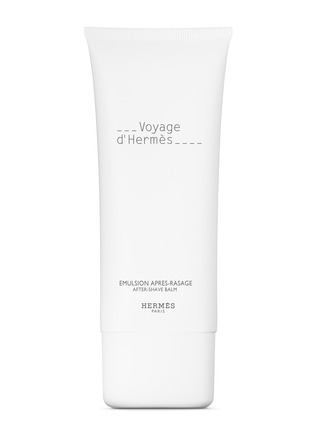 Hermès designer Philippe Mouquet created a 'nomad' object bottle for Voyage d’Hermès, conceived for voyages and symbolic of movement. Non-greasy in texture, this After-Shave Balm provides hydration and comfort to the skin. Its fluid and soft formula is easily absorbed and soothes razor burns.